The new Mossberg 500 ATI Scorpion shotgun. Mossberg & Sons presented their new Model 500 ATI Scorpion 12-gauge shotgun at SHOT Show this year. This new shotgun is a pairing of America’s most popular shotgun and the advanced accessory components designed by ATI to maximize the effectiveness of the shotgun. Just a couple of years ago the Mossberg 500 outsold the Remington 870 in total numbers since production began. The Remington 870 had been the most iconic shotgun in American history – to that point. Mossberg has consistently worked at producing an outstanding shotgun, with verified durability, and the new ATI Scorpion is just another example of Mossberg’s commitment to making their firearms even better. The Mossberg 500 has become the most popular shotgun in America. The Mossberg 500 is a proven shotgun design, and has been widely adopted by law enforcement, and the U.S. Military. The Mossberg 500 has several models to accommodate the wide ranges of shotgun uses, and shooter preferences. This new Model 500 ATI Scorpion shotgun is particularly designed for professional use such as law enforcement and military, but could also be a very good competition shotgun as well. The Mossberg 500 ATI Scorpion is a perfect law enforcement set-up. 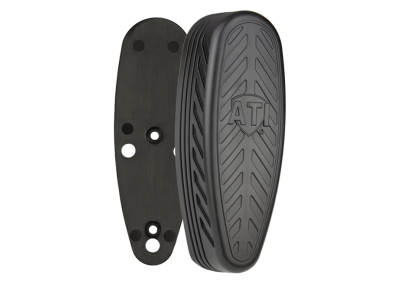 The ATI Scorpion Akita recoil pad. Having an adjustable stock is a huge benefit for adapting to shooter size, but also provides options for tight spaces. The Akita Scorpion recoil pad helps reduce the heavy recoil from a 12-gauge shotgun, which can improve accuracy and follow-up shots. In addition, having a recoil reduction system may actually encourage officers to use a tremendous firearm, that can often be left behind due to painful recoil from standard stocks. The ATI T2 TactLite adjustable stock comes with a cheek riser, and Akita Scorpion recoil pad. The T2 TactLite stock comes with an integrated pistol grip that has its own recoil reduction soft padding on the rear. This should make recoil even more endurable. The addition of an integrated cheek riser is more important than just a gimmick. It allows individual officers to perfectly match the shotgun to their own personal features. This feature can bring the shooter’s eyes right on target to the sights, improving accuracy, and even providing some recoil abatement. The ATI Halo 2 heat shield with ghost ring sights. The Mossberg 500 ATI Scorpion has a slightly modified but pattern. The addition of Picatinny style rails allows the completion of an excellent shotgun selection. Instead of just “iron” sights, or even the Ghost-ring sights on the ATI Scorpion, the shooter or agency can add a reflex sight of choice. The rails on the front of the heat shield allow for the necessary light source for low-light shooting scenarios. The addition of a Halo side-saddle with Add-A-Shell holders provides shooters with up to six (6) additional shotgun rounds. This is a very important feature, as it allows the shotgun to be loaded with standard 00 buck shot, while slugs rest in the side-saddle ready to be loaded for specific needs. The ATI Akita for end is lightweight with a slightly textured face for sure grip. The Mossberg 500 is a versatile and time-proven shotgun design, that has gained wide popularity and has overtaken the venerable Remington 870 as America’s most popular shotgun. The new Mossberg 500 ATI Scorpion, takes the best of the Model 500 and pairs it with specifically designed components that not only provide a great looking final product, but a shotgun that has superior capabilities as well.